A new single from BILLIE IDLE® is in the works, and we’re perfectly positioned to have a look at “Soshite, mata.. (そして、また、、)”. Perhaps to save on sets, the eighth single PV gets the treatment of a Showa variety show with First Summer Uika and the girls as the musical guest. A quick introduction from the bowtie host puts us on our way to the blank canvas stage and rows of stage lighting. “Soshite, mata…” plays itself with simplicity and only the changing lights to set its mood. The stage uniforms keep with the theme; they’re not exactly the flashy, form-fitting wear we see in most idol PVs. The faux burned-in onscreen credits give the songwriting credits to new member (and old member?) Pour Lui and composition credit to Kevin Marks. Which begs the question: how much influence will the former BiS leader have on her new group? “Soshite, mata…” will be released with the incredibly low sticker price of 500 yen (approx. $4.60 US), which means it probably won’t last long in stores. You can preorder “Soshite, mata…”, set for a February 6, 2019 date, at the retailers listed below. 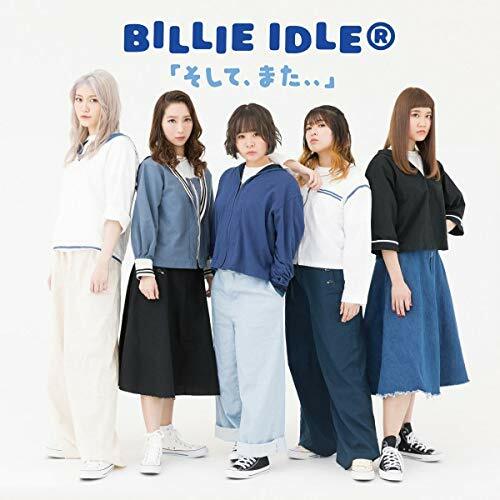 Billie Idle (stylized BILLIE IDLE®) is a Japanese female pop group that was founded in 2015. The concept of the unit is NOT IDOL. The theme is Neo 80’s. They are produced by Nigo (and formerly Watanabe Junnosuke). The group was announced at the final concert of the idol group BiS in 2014, and that the group would feature former BiS members First Summer Uika and Hirano Nozomi. Auditions were held to find members, and Momose Momo and Yasui Yuuhi joined. The group made its official debut in March 2015, releasing the song “anarchy in the music scene”. In 2016, original member Yasui Yuuhi quit the group due to health issues, and Momose Momo’s sister joined as Akira. On May 12, 2018, former BiS founding member Pour Lui was announced to be joining as a new full-time member starting on June 6 of that same year. BILLIE IDLE®’s current lineup includes First Summer Uika (ファーストサマーウイカ), Hirano Nozomi (ヒラノノゾミ), Momose Momo (モモセモモ), Akira (アキラ), and Pour Lui (プールイ).